Can Executive Functions Be Trained in Healthy Older Adults and in Older Adults with Mild Cognitive Impairment? Executive functions (EF) refer to goal-directed, flexible use of cognitive abilities, e.g., solving problems, sustaining, dividing and shifting attention according to task demands, and inhibiting inappropriate responses (often measured by the classic Stroop task, where the name of the color of the ink in color incompatible words are named, e.g., the word “green” is printed in blue ink instead of green ink). Executive functions decline with older age, and given the effect that executive dysfunction has on various situations and populations, it is of particular interest to find out whether these functions can be improved with practice. With advancing age, diseases that have either direct or indirect effects on brain function and cause cognitive problems, become increasingly common. One of these conditions has been coined mild cognitive impairment (MCI), which refers to persons who do not fulfil the criteria for dementia, but who show some form of cognitive decline. MCI has become an important research topic, as patients with this condition have been shown to be at risk of developing Alzheimer’s disease (AD). Although episodic memory impairment is the key deficit in MCI, EF are known to interplay with memory, and therefore is of interest to consider whether EF training could be beneficial for MCI patients. 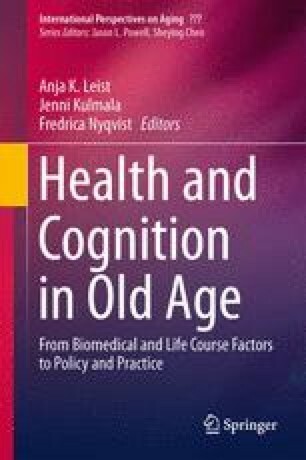 In this chapter, results from EF training studies, particularly from working memory (WM) training studies in old age will be summarized. In addition, a final section briefly describes EF training studies that have been conducted in MCI patients thus far. This chapter was reviewed by Docent Mira Karrasch, Ph.D. and Postdoctoral Researcher Anna Soveri, Ph.D., both affiliated with the Department of Psychology and Logopedics, Abo Akademi University, Turku, Finland. This work was financially supported by a grant from the Academy of Finland (No. 251788).